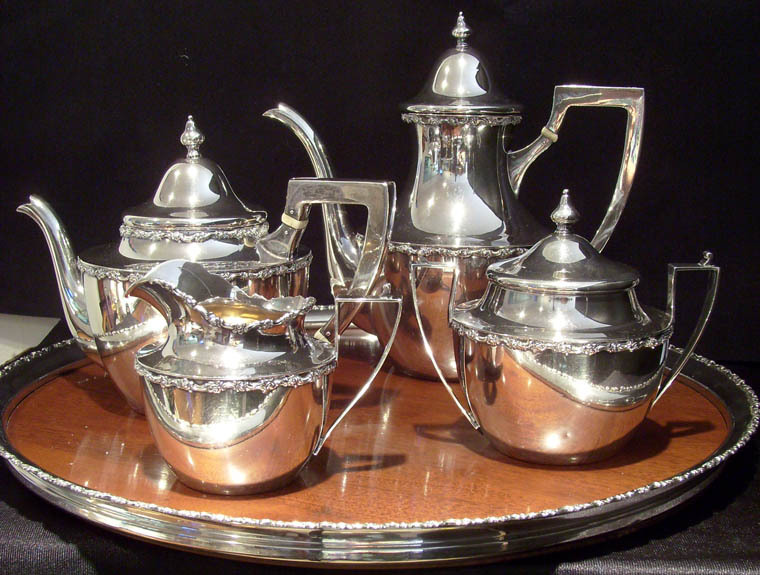 Shreve & Co. Sterling Tea Set -- Beautiful five-piece sterling tea set consisting of coffee pot, tea pot, sugar, creamer and tray. 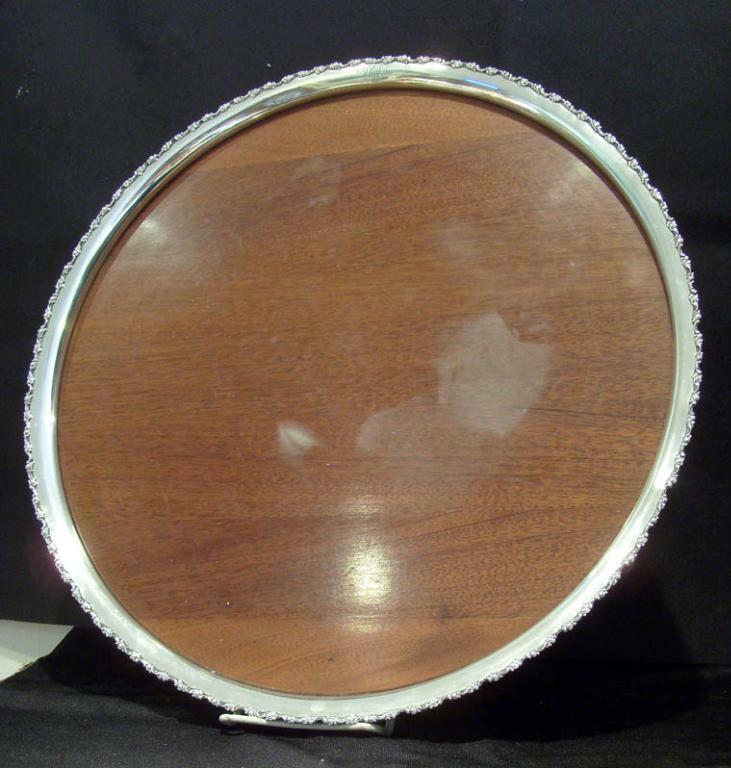 The tray is wood with a sterling band around it. It has some stains, but is not otherwise damaged in any way. Each piece is signed Schreve & Co. San Francisco, 925-1000, Hand Decorated. 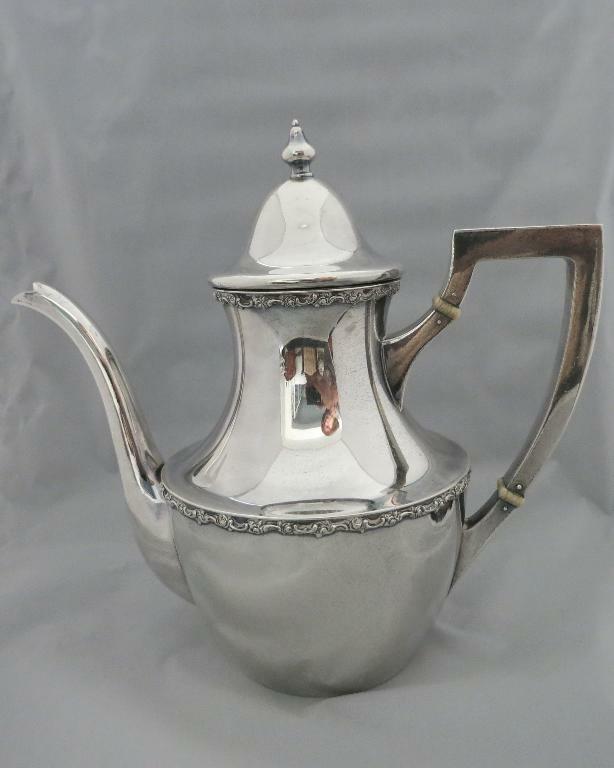 The coffee pot measures 8 1/2" tall x 9 1/2" wide including handle, the teapot is 6 1/2" tall x 9" wide including handle, the sugar is 5" tall x 6" wide, and the creamer is 3 1/2" tall x 5" wide. 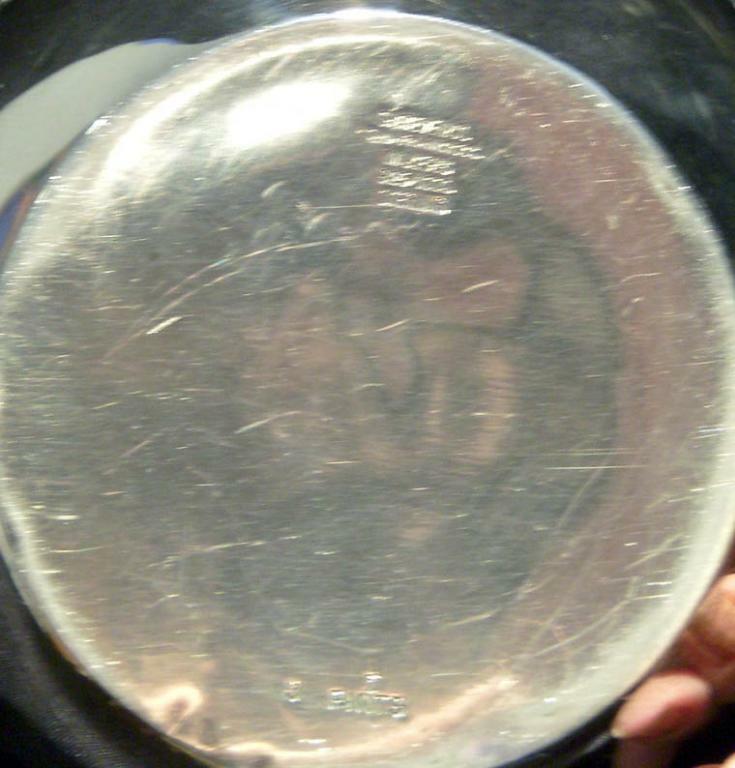 The tray has a diameter of 16 1/2". 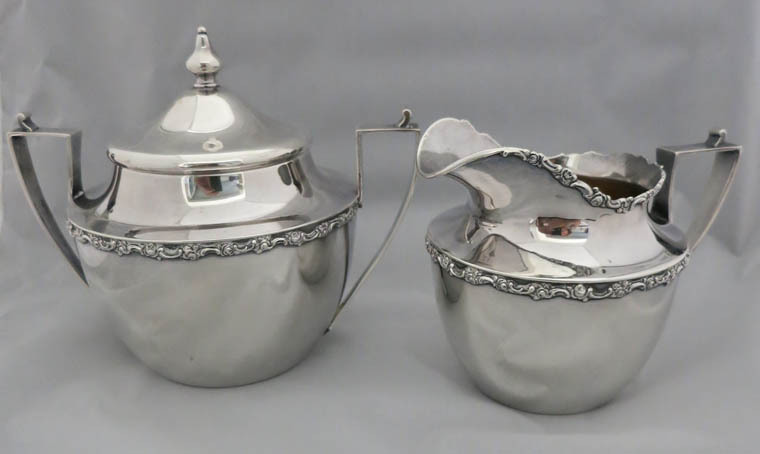 Beautiful five-piece sterling tea set consisting of coffee pot, tea pot, sugar, creamer and tray. The tray is wood with a sterling band around it. It has some stains, but is not otherwise damaged in any way. Each piece is signed Schreve & Co. San Francisco, 925-1000, Hand Decorated. 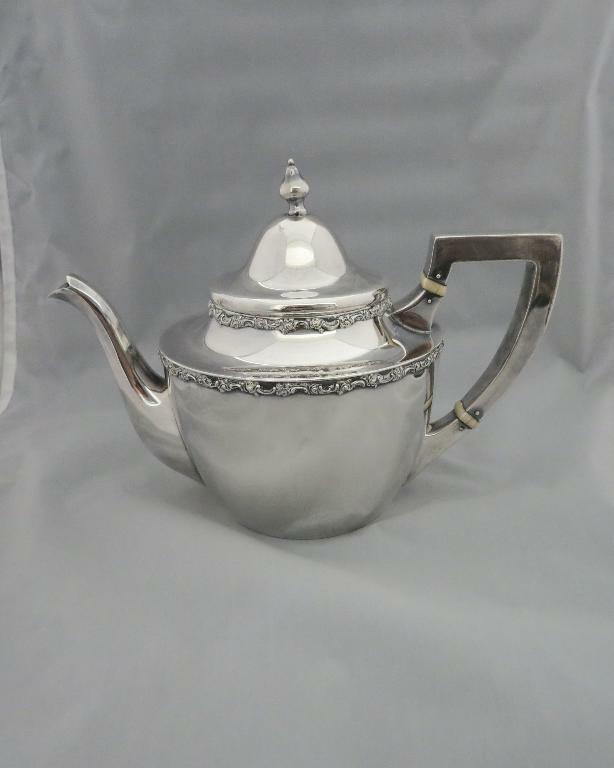 The coffee pot measures 8 1/2" tall x 9 1/2" wide including handle, the teapot is 6 1/2" tall x 9" wide including handle, the sugar is 5" tall x 6" wide, and the creamer is 3 1/2" tall x 5" wide. The tray has a diameter of 16 1/2".